You may know quotation marks as “quotes” or as “inverted commas”. Quotation marks are used to mark the start and the end of special text that is outside of the text you are writing. There are two types of quotation marks used in the English language – (“...” and ‘...’) – We will look at both of these later on. Quotation marks should always be used when writing the name or title of a book or a film. I went to see “Dirty Dancing” yesterday. My favourite book is “Little Women”. Some people choose to not use quotation marks in this case, and instead prefer to use italics: Dirty Dancing and Little Women. Both examples show that the titles are in fact titles and not just normal text. She went to see “Dirty Dancing”. 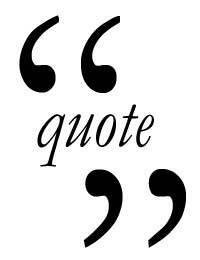 Quotation marks are used when directly quoting what someone else has said, or has written. This shows that the information is additional to what has already been written. Words within sentences that are considered jargon or slang are usually in quotation marks. So, if a word has a particular type of meaning, but when in relation to the rest of the sentence it isn’t true, then quotation marks are used to emphasise this. The firemen were called to see to the “fire”. However, it was only a tiny amount of smoke. Using double or single quotation marks is more a matter of preference than one being correct and one being incorrect. However, if you need to use quotation marks inside another set of quotation marks, you can use double quotation marks inside single ones, or single ones inside double quotation marks. Using full stops with quotation marks can cause some confusion. There is a simple way to remember when to use them inside or outside: when the quoted words end in a full stop, the full stop goes inside the quotation marks; If the quote doesn’t end in a full stop, it goes on the outside of the quotation marks. I’m going to read “Lord Of The Rings”. Apostrophes are different to quotation marks as they do not show special text, but rather show missing letters in certain words. Generally, the apostrophe goes wherever the missing letter would have been. Apostrophes are not normally used in formal writing, and you should really only use them when writing informally. Quotation marks can be used within any form of writing, and are often found in formal writing such as essays, exam papers and so on. Quotation marks and apostrophes are common in the English language. If you can learn where they go and how to use them, it makes it much easier to read English text.